Week 1 of my #drop30 challenge is done. I started the challenge first thing on Monday morning; whilst this might have been a mistake if I had been at work (Monday mornings are pretty blue when you work, I find) I am still on the last few weeks of maternity leave, and I found it motivating to begin a fresh week with a fresh attitude. Firstly, I craved bread. A lot. White, crusty bread with butter. Which I find odd because I don't regularly eat that, lol! But I really wanted some by Wednesday. By Wednesday I was starting to feel a bit of a difference; I didn't *feel* so bloated (but with so much weight to lose that doesn't change the appearance of my tummy). I also found it tough not having a hot chocolate, or a snack when out and about. It does make things feel a little dull. Another challenge was not eating the same as Luke; he isn't on a diet, so has free reign to eat and drink what he likes. That's been tough to endure, though he has tried to moderate what he has to make me feel better and be supportive, lol. I tried some new food this week, including vegetarian korma, vegetable chill (not a fan of chili normally), and ham and sweetcorn chowder, which I enjoyed. I also ate regularly throughout the day. Since becoming a mummy, I've spent the last 4 months eating nothing all day and then filling my face in the evening when Jake was asleep. I also noticed that before I was taking on calories every day which I didn't think about; that hot chocolate from Starbucks when out for a walk; the sandwich I bought from the supermarket instead of making my own... It goes to show that I really wasn't thinking about what I was eating and drinking before. I had stopped taking any care of myself. 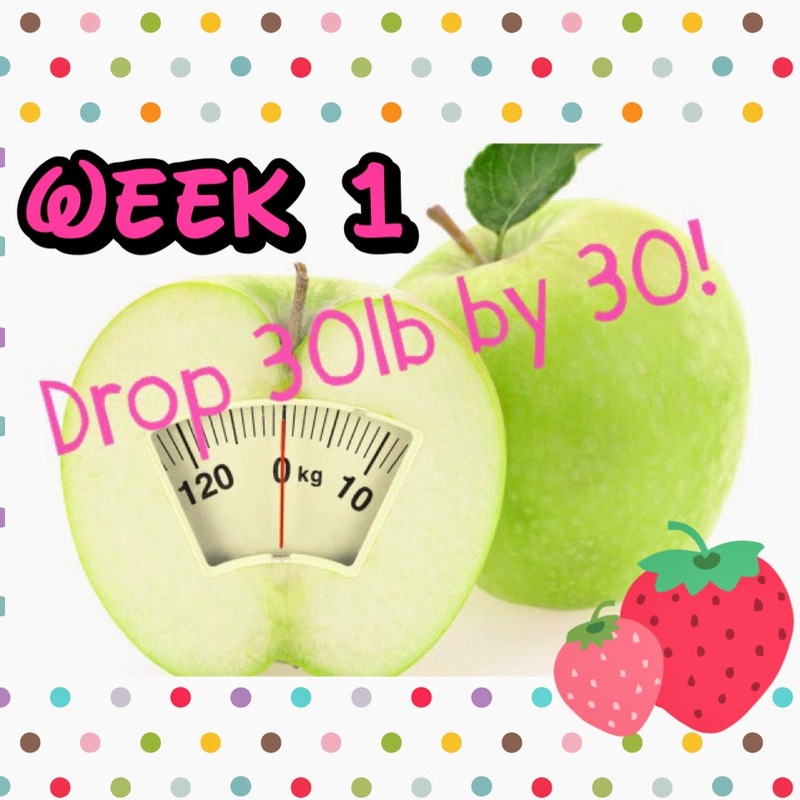 Because I have been keeping up with your #drop30 challenge since you began but just haven't mentioned it. I think mostly because I knew I should be doing it, or something similar to it too and didn't want to make that 1st step. But in all honesty, when I read this post a few days ago and saw how well you'd done in just 1 week, I began calorie counting & getting fit again secretly. LOL! I am so ashamed to admit it but I'm still carrying baby weight from pregnancy 1 which is just not on! So what I am trying to say is congratulations on such an amazing start to the challenge. I wish you the best and I am here to support you if you ever need it. Thank you so much for inspiring me not to just recognise that I need to do something but to physically make that change. I look forward to seeing how you progress and hopefully I too will be making some serious improvements in diet and exercise and ultimately in my physical well-being.